Was your New Year’s resolution to eat healthier? How long did it last? A few days? A week? I usually start out the year exercising daily and eating my five-a-day quota. But it doesn’t last long, and by the middle of January it all falls apart. My cravings for the warmth of winter favorites, from gooey macaroni and cheese and rich beef stew to creamy hot chocolate and flaky cinnamon buns, always seem to win out. When it’s cold and grey and blustery, all I want to eat are hearty, indulgent favorites. And risotto is high on that list. A steaming plate of creamy risotto is just the thing to warm the belly on a chilly night. But it is generally not the thing to flatten that belly. Although my resolution this year is to simply enjoy, to eat for pleasure, and to savor every bite, nutrition still counts. For the moment I’m content to hide these extra few pounds under bulky sweaters and puffy jackets, but I know that I’ll have to pull out that bathing suit soon enough. So while I may not make it to the gym every day, I’m trying for some balance. A little more fruit and a little less ice cream. A handful of carrots in place of those potato chips. And more whole grains across the board. Barley risotto has all the wonderfully creamy steaminess of traditional risotto (which is typically made with Arborio rice), with the added benefits of toothsome texture and plenty of fiber. The sweet onions and salty cheese build plenty of flavor in this tasty risotto. Although lovely as is, this risotto is also fantastic topped with a few grilled shrimp for a special meal. Preheat the oven to 400 degrees. Toss the sliced onion with half the oil and roast on a baking sheet until soft and slightly browned at the edges, about 10-15 minutes. Toss the hot roasted onion with the vinegar. Season to taste with salt and pepper. Meanwhile, sauté the garlic in the remaining oil over medium heat until fragrant. Add the tomato paste to the garlic. Add the barley and cook, stirring, about 3 minutes. Stir in the wine and simmer until evaporated. Add half a cup of the stock, and cook, stirring often, until the liquid is mostly gone. Add the remaining stock by the half cup, stirring often, until the barley is tender and only a small amount of liquid remains. Stir in the cheese and salt and pepper to taste. Fold in the onions. Serve hot with extra cheese, if desired. 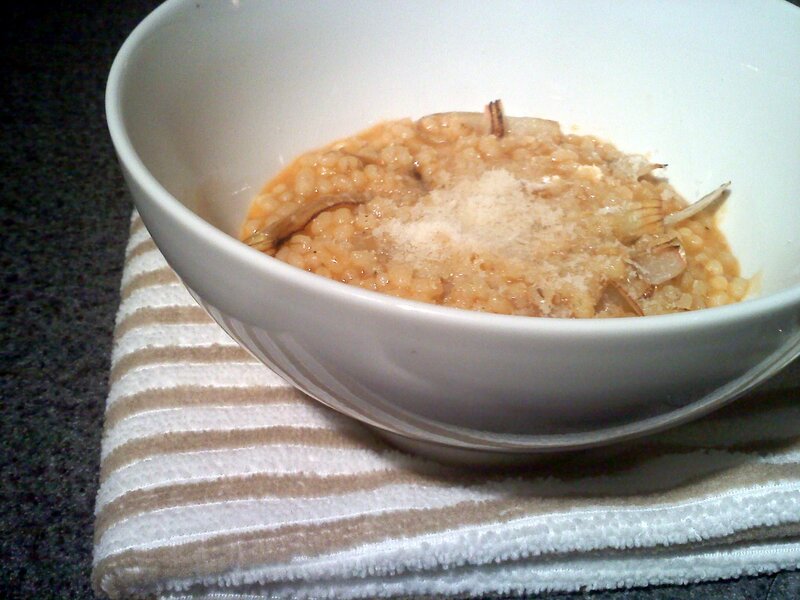 I love risotto and this looks like a nice and hearty recipe to try for this cold and gross weather! 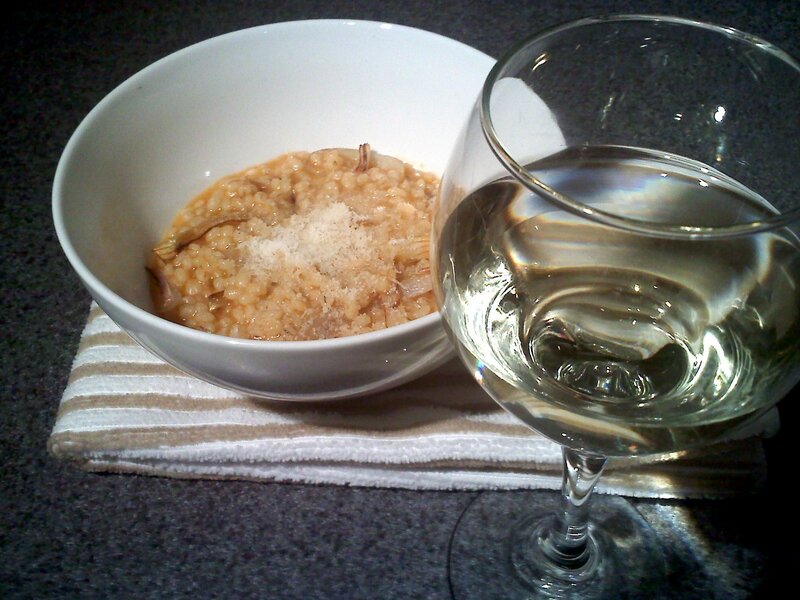 Great idea to cook barley like risotto and with these simple but heartwarming flavors! Barley instead of rice with roasted onion in a risotto dish…that just sounds marvelous! Very creative idea! I love the idea of replacing the rice with barely and combine it with a roasted onion? That would be wonderful and I bet the taste is out of this world. this recipe is perfect for my vegetarian husband—great combination of veggie stock, tomato paste and white wine for terrific flavor profile. I’d like to try this with farro as well. Thanks, Katie! What an excellent alternative to rice risotto. This is incredibly clever at so many leves and the health benefits – awesome for the kidneys – wow! I am so glad some one out there is being more healthful – I have yet to climb into that band wagon. Love the addition of roasted onions, i can only imagine the flavor. Just reading down the list of ingredients I could tell how rich and warm this risotto would taste. Great for a cold day like today. I just made some broccoli cheddar soup today, so clearly I agree 100%. Cold weather and snow storms call for hearty fare, not lean times, all the time. So far this year, hubby and I have stayed on the straight and narrow in our eating habits, and this sounds like a wonderful dish to help us stay there! Katie, this sounds perfect–rich flavor, with almost no fat, just a whisper of cheese (Those who are not health conscious don’t even have to know!) Sounds like a satisfying dish to have on this cold, blustery day. I really like the idea of applying the risotto method to other (especially healthier) grains–after all, it’s a way to cook rice, not a type of rice. Eating healthy is always a good resolution, but when you’re in a cold snap like we’re in now, one needs comforting foods like chili, risotto, stews, braised meats and wine. As others have said–it’s already horrible out–why deprive ourselves of all good things? Then again, I’m OK with working out if it can justify all of those good foods. You know, I eat quite healthy on daily basis (except for October last year, when I was awfully busy), I swim nearly every day, but one year ago I came back to smoking and now I am more addicted than before (I was not smoking for three years)…. I like barley a lot, as this is one of the most popular grains in Poland (called “kasza jeczmienna”), and I experimented with some risottos with barley, as well as buckwheat. My friend even invented the Polish name for that – meaning “KASZOTTO” (from “kasza” (kasha) :))) It must taste delicious with roasted onions.